That truth hurt at a meeting in Denver last year, when DFM CEO John Paton used the description in a meeting of our company’s senior editors. Our newsrooms have made lots of changes to increase and improve our use of digital tools and our engagement on digital platforms. But I had to nod my head when John said it. I’ve visited all of our daily newsrooms and some of our non-dailies and the statement rang true. So we’re going to take a massive wrench to the culture and workflow of our newsrooms and unbolt them. Welcome to Project Unbolt. I started working on the plan for Project Unbolt almost as soon as John used the metaphor. He was right and we needed to change our newsrooms’ culture and workflow so he couldn’t repeat that observation this year. 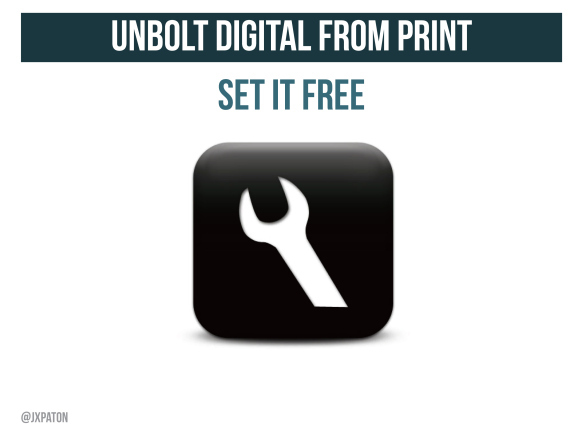 We need to “unbolt” Digital First newsrooms, so that they are Digital First in culture, processes and priorities. Though digital in focus, the operations should remain capable (as long as needed) of publishing print products, but the regional print operations will be bolted on to the core digital newsroom. We will identify key characteristics of an unbolted newsroom. All newsrooms will assess where they are in achieving those characteristics and identify goals to help them move toward unbolting. I will guide that process for all newsrooms, but my primary role initially will be to embed for an extended visit to the New Haven Register, seeking to accelerate and guide that newsroom’s unbolting. I also will work closely with three other newsrooms that will be working at the same time on their accelerated unbolting plan: the Berkshire Eagle, El Paso Times and the News-Herald in Willoughby, Ohio. I will make shorter visits to their newsrooms after the extended visit to New Haven. I will continue guiding New Haven and the other pilots from afar and with occasional shorter visits, but I will move on to a different size and/or type of newsroom for a second extended visit. Through a blog and training, we will share the unbolting lessons companywide and beyond. Digital First Media’s senior editors have agreed on the general characteristics of an unbolted newsroom (recognizing that they will vary by size and other factors). Each editor (or perhaps the entire newsroom) will assess each newsroom by those characteristics on a scale of 1-5, with cluster and/or regional editor checking the score and discussing areas of disagreement. Each editor will choose three priority areas to work on where the newsroom scored low. Cluster editors and I will work with the editors to develop plans for raising those scores by at least two notches in three months. I will spend an extended period (about 6 weeks, most of February and March) at the New Haven Register, working with Matt DeRienzo and his staff to unbolt it completely and make it a model for the Digital First unbolted newsroom. At the same time, the Berkshire Eagle, El Paso Times and News-Herald will work on their own unbolting plans. I will make shorter visits to those newsrooms and assist in their unbolting from afar while I’m in New Haven. Local editors retain all authority for making day-to-day news judgments, assignments, etc. I will focus on working with editors to change newsroom operations such as processes and structure and may make staffing recommendations. I will work collaboratively with the local editors, with a shared understanding that a major purpose of this project is to push the editor and staff beyond their comfort zones. We will develop metrics before the project to measure as best we can changes in digital audience and engagement, print audience, digital and print revenue and other performance measures. We will also seek to measure changes in newsroom processes, production and culture. We will examine and consider changes in all newsroom workflows, including handling of local and Thunderdome content, promotion of content in social media and digital and print production. Project Unbolt will include some training by Thunderdome staff and/or external trainers. Project Unbolt probably will include some significant newsroom reorganization, but will concentrate more on what the newsroom does than on structure. Depending on the cluster situation of the newsroom, Project Unbolt will include some work with other newsrooms in the cluster, such as development of a cluster breaking news team or investigative team. The cluster and regional editors will be involved throughout the project, but especially in any changes that extended beyond the individual newsroom. The four pilot newsrooms have different cluster situations, so this might play out differently in each case. After completion of the first newsroom unbolting project, we will select a second newsroom for unbolting. The purpose of the second project will be fine-tuning based on lessons of the first project and applying the principles to a different type of newsroom. Newsroom efforts are focused on covering news and producing stories for digital platforms. Stories are live (when possible), interactive, visual and relevant. Newsroom processes are designed to provide quality, accurate content quickly for digital platforms, with print editors harvesting and adapting digital content to produce print editions. Newsroom engages the community effectively through a variety of tools and techniques: social media, blog networks, crowdsourcing, curation, contests, live chats and in-person engagement. Meetings, budgets, staffing, training, goals and communication reflect the newsroom’s digital priorities. In planning and execution, newsroom staff thinks of mobile audience and delivers strong mobile content. Staff uses mobile tools to gather content and post from the field. In processes, communications and discipline, newsroom reflects commitment to providing original (or attributed), accurate, verified content; to correcting errors quickly and transparently; to avoiding conflicts and disclosing unavoidable conflicts; to accountability. I will elaborate on the six characteristics described above in a subsequent post. I will look forward to seeing how this approach works with essentially independent, totally local community weeklies. Unbolting will certainly be a different process for each type of newsroom, Harry. But the future is as certainly digital for weeklies as it is for dailies, so we’ll need to unbolt weekly newsrooms as well. I just have one request … can someone either teach us how to code so we can create story packages online and/or have a point person in each cluster to do that for us? Will that be covered? We certainly need to expand our ability to create better digital story packages. That may be a combination of teaching more code to journalists, working more closely with our developers and learning to use storytelling tools such as Thinglink, Newhive and Scrollkit. DID SOMEONE SAY SCROLLKIT? https://www.scrollkit.com/s/ZSDUFIz 😀 Ping me! Don’t wait! Can’t wait for updates on how the papers are handling this new and exciting approach! Wonder if we could figure how to downstream this. Seems to me you need folks coming out of j-school better trained in what you are discovering. I’d love to see if there is a way to do the knowledge transfer and maybe experiment on this end to bring some value back up. Definitely interested in sharing what we learn with J-schools and journalism professors, Doug. You’re absolutely right that we have to work together on this. I’ll be speaking this spring to a group of student media advisors and I usually speak at a few universities each year (spoke at LSU last month and scheduled for Savannah State next month). Would love to talk about other ways to work together and share what we learn. Definitely. When are you at SavState? It’s a bit of a ride, but if it’s the right day, I might be able to get down there. Otherwise, would love to chat by phone or email to see what we can do. We also have several lecture opportunities that I’d like to see if we also can bring you in on. I am interested in the execution of some of the tactics. Often times, when seeking feedback, these conversations are done with local editors. That means city editors, senior editors and managing editors. Digital leaders aren’t often called “editors” and, as you said, are often bolted onto the organization. Not just in workflow, but in organizational leadership, too. So, when it comes to tactic #s 2 and 3, I hope you make sure those local newsrooms are including their digital team members in the process. Actually, the existence of a “digital team” may be evidence of why we need to unbolt. Yes, absolutely, digital leaders of a newsroom should be involved in the assessment. I’ll be sending out instructions on the assessment to DFM newsroom leaders soon. When we are fully unbolted, “digital team” will be synonymous with “newsroom,” and we’ll have a print team that produces that pulp product. Looking forward to seeing how this works out first-hand as we work on this in Willoughby. As you reorganize newsrooms, I’d ask that you don’t create rigid investigations teams. The best investigative stories usually come off of beats and the beat reporters who unearth them should be given the opportunity to chase them. If they need help, give it to them. I’ve been too many places where the projects team was heavy on pomposity and light on production. Good point. The best approach that I’ve seen is a mix: Beat reporters are encouraged and expected (and given time) to develop investigative stories. But an investigative specialist or team works on those that don’t fall on a beat or partners with beat reporters (who often still have to cover a beat) or partners with inexperienced reporters who need to learn investigative skills.